PCOS is a serious genetic, hormone, metabolic and reproductive disorder that affects women and girls. It is the leading cause of female infertility and a precursor for other serious conditions including obesity, type 2 diabetes, cardiovascular disease and endometrial cancer. PCOS Awareness Month is a federally designated event created to increase awareness of, and education about, PCOS among the general public, women, girls and healthcare professionals. The aim of PCOS Awareness Month is to help improve the lives of those affected by PCOS and to help them to overcome their symptoms as well as prevent and reduce their risks for life-threatening related diseases such as diabetes, cardiovascular disease, nonalcoholic fatty liver disease and cancer. 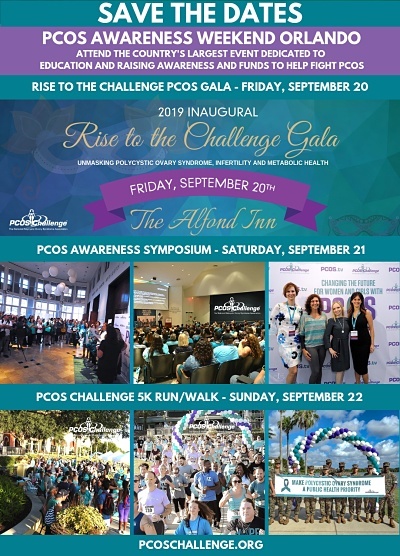 PCOS Challenge: The National Polycystic Ovary Syndrome Association is the sponsoring organization for PCOS Awareness Month and offers supporting resources, information and events. Sign up as one of our PCOS Awareness Month partners to receive updates and access to our PCOS Awareness Month Toolkit including social media graphics, infographics and educational materials.